IMPHAL. 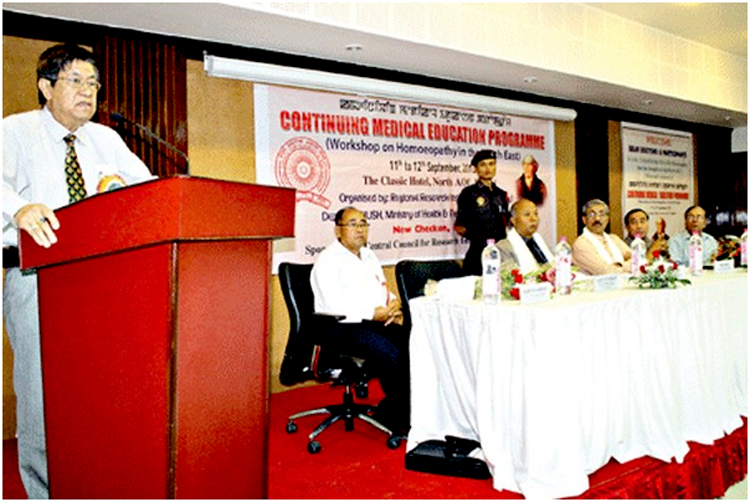 Sep 11: A workshop on 'recent advancement of research and updates on homoeopathy, for the homoeopathic doctors in the North East' organized by The Regional Research institute (Homoeopathy), Imphal under CCRH, New Delhi was held at Classic Hotel with Regional Institute of medical Sciences (RIMS) Director Dr. Sinam Sekherjit inaugurating the workshop as the chief guest. Expressing that patients suffering from various ailments would benefit immensely if there is timely and proper administration or undertake of homoeopathic treatment. Dr. Sekherjit pledged to contribute his mite in the advancement of homoeopathic treatment. He also called upon the workshop participants to reach out to the general public, who wish to avail homoeopathic mode of treatment. The technical session in the morning had Dr. Manglem Singh, HOD, Gynaecology RIMS deliberating on 'Update on gynecological disorders by modern medicine expert'; Dr. Avhijit Chaterjee of Materia Medica (NIH, Kolkata) on 'Update of homoeopathic therapeutics of gynaecological disorders by eminent homoeopath'; and CRI (H) Noida RO Dr. Padmalaya Rath on 'Research update on homoeopathy in gynaecological disorders by Council's scientist'. Dr. R.K. Manchanda, Director General, CCRH, Dept of AYUSH,New Delhi, Dr. M. Nara Singh, former Minister, Dr. W. Motilal, Director (retired) state Health Service and Mr.R.P. Gadi, CCRH Accounts Officer also attended the workshop's inaugural session.